In January of 2013, Alexei Navalny was charged with fraud and the theft of $510,000 worth of corporate property from Kirovles, a state-owned timber company. In January of this year, the oppositionist, blogger and lawyer, Alexei Navalny, was charged with defrauding Kirovles, a state-owned timber company. According to investigators, as advisor to the governor of Kirov Oblast, Navalny allegedly organized the theft of corporate property worth 16 million rubles ($510,000). The Investigation Committee of Russia (ICR) stated that it had managed to gather enough evidence to prosecute. The ICR spokesman for Kirov Oblast, Andrei Vasilkov, described the case as "common in the economic sphere." Many would beg to differ: ranging from Navalny himself and his like-minded supporters to the flank of European politicians and diplomats closely monitoring the progress of the trial, who have attended hearings and openly stated that the case "has special significance." The verdict could impact relations between Russia and Europe. The main question is how. According to the director of the Moscow Carnegie Center, Dmitry Trenin, the lawsuit is tainting the atmosphere of bilateral relations. He is sure that a conviction would not lead to instant ramifications in the two sides' long-term economic or political relations. "Nevertheless, Western leaders will, of course, be forced to censure the political nature of the trial of Alexei Navalny, the bias of the Russian judiciary and the pressure on non-sanctioned opponents," notes Trenin. "It would be comparable, on a smaller scale, to the West's reaction to the guilty verdict brought against Khodorkovsky." In comment about Europe's options in the Navalny case, he stated that it would be a mistake to respond by reneging on agreements already reached or freezing negotiations in progress, such as the introduction of a visa-free regime for Russian citizens to the EU. "Those in Europe who would like to see a more civilized Russia should strongly advocate the abolition of visas," asserts Trenin. Alexei Mukhin, general director of the Center for Political Information, is convinced that "the Europeans have always managed to divorce politics from economics and remain true to themselves." 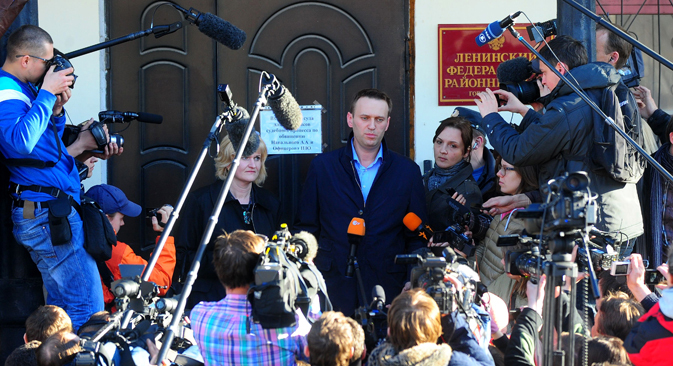 Analysis:What does Navalny get from running for presidency? In other words, they will not attempt to hinder the growth of the EU's economy and break off negotiations on visa-free travel to Europe for Russian citizens for political reasons. Former head of the Policy Planning Department of the French Foreign Ministry, Marie Mendras, agreed in an interview with Kommersant Vlast: "The establishment does not want to turn the current situation in Russia into a political issue, since economic diplomacy is a priority for Paris." "However, the trial of Alexei Navalny will be widely discussed in European circles long known for harboring anti-Russian sentiment, including the OSCE and the European Commission," says Mukhin. The matter is also fertile ground for proponents of a European equivalent to the Magnitsky list. "Even U.S. society is beginning to doubt the expediency of the Magnitsky list. Many in the US regard the act as unconstitutional, since those listed were selected according to arbitrary criteria, besides which none of the persona non grata had been the subject of a legal investigation prior to their inclusion in the list," Mukhin points out. "If Europe wants to draw up its own Magnitsky list, there must be a judicial decision. Such a ruling would be unprecedented and naturally provoke a series of responses from Moscow, complicating matters even further." However, the European Parliament's attitude to the trial is openly critical. The deputy head of the European Parliament on EU-Russia cooperation, Werner Schultz, said the following in an interview with Kommersant Vlast: "The Navalny case is just the tip of the iceberg. There is a whole stack of lawsuits and investigations related to the protests against Putin's inauguration a year ago. It is time for the EU to follow America's example and adopt the Magnitsky list." Lastly, a third viewpoint is held by renowned Russian expert and president of the National Strategy Institute, Mikhail Remizov. In his opinion, the trial of Alexei Navalny will mainly impact the dynamics of Western public opinion: it will further cloud Russia's already negative image in the eyes of Europeans. Remizov's opinion is shared by former Polish Foreign Minister (1993-1995), Andrzej Olechowski: "I can't imagine there will be any sanctions," he said in an interview with Kommersant Vlast. "Russia is not a country that will take them lying down. However, such cases will lead to ever greater frustration and disappointment with Russia. That could set Moscow's relations with the EU back many years."